Now more than ever: You are needed in Richmond to remind the General Assembly that Virginia Stands for Life! The Virginia General Assembly will convene in Richmond on Wednesday, January 8, to begin its 2014 legislative session. With a new political climate in Richmond (including the inauguration of a new governor), the voices of Virginians who value the sanctity of life are needed more than ever at the General Assembly to support the progress we’ve made-such as the ultrasound informed-consent law, the abortion clinic safety regulations, and legislation prohibiting coverage for abortion on demand in the new federal healthcare exchanges that will operate in the commonwealth. We need to hold on to these gains and encourage further legislative efforts to protect life in Virginia. That’s why it’s important that you make plans to join us here in the capital city for the 2nd Annual Virginia Stands for Life rally on January 8. Jointly sponsored by the Virginia Catholic Conference and other state and national pro-life organizations, the rally is designed to demonstrate broad and ongoing support for pro-life efforts in the state. The pro-life movement has gained remarkable ground in the past few years in Virginia’s and other state legislatures across the country. This progress has led to a 16 percent decline in Virginia’s abortion rate in four years. We need your presence to ensure we keep this momentum going! The event begins with a 9 AM Prayer Walk on the Virginia State Capitol Grounds, followed by a rally with speakers and special guests (stay tuned for an exciting lineup!) at the Bell Tower on the Capitol Grounds beginning just before 10 AM. Please direct questions and RSVP to Virginia Podboy at Virginia@vacatholic.org or (804) 225-8565. 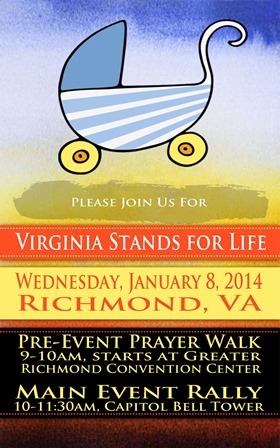 Join us on January 8 and remind the General Assembly that Virginia Stands for Life!